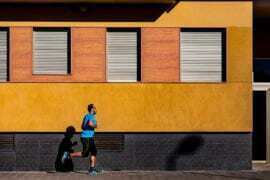 Bad breath continues to be a problem for many. Not only can it bother people around them, it can also bother those who have it. It is never easy to admit exactly how much it can trouble those who possess poor odour in this regard. And in this very regard, denial seldom helps. You may think that there is no solution for this, or that there is no road toward impeccability in this area. You rarely have to think twice about covering your mouth during your spontaneous yawns, and occasionally may feel embarrassed to converse with others at small distances. There is nothing to be embarrassed about, you say, in attempts to reassure yourself that not everybody is fussy when it comes to bad breath. That is until of course, you consciously realize individuals moving away from you an inch or two whilst you speak. Of course it can be a sensitive topic, especially because it has the potential to play with a person’s confidence. This is understandable because nobody wants to feel unpleasant or be perceived as unclean. Therefore, it is definitely a topic of importance and worth giving some attention. After all and most importantly, bad breath is usually a red flag that indicates bad oral health. Bad oral health is a warning to tell us that a whole lot of other bad things can or are occurring like ulcers, gingivitis, and cavities. And in that case, a miswak could be just the special thing you are searching for to reduce or even eliminate your oral health issues, In sha Allah. A miswak is a pencil-sized twig used as a natural means to clean teeth adequately through a gentle chewing and brushing process, which was frequently practised during the early Islamic period. However, it is more than your usual toothbrush or any other portable teeth-cleaning equipment that you might insist be in the “must have” category such as your mouthwash, toothpaste, floss etc. These are all items you probably never miss throwing into your luggage during your long distance travels. Imagine pretty much all of the benefits of these deemed essentials in one 15cm stick. Astounding, no? Usually derived from the Salvadora persica tree, also known as the toothbrush tree, a miswak’s natural properties serve as chemical plaque control. This happens whilst simultaneously providing mechanical plaque control through contact of the twig with surfaces of the teeth – all naturally. So what does this mean exactly and what makes a miswak undeniably amazing? Well, as far as numerous researchers are concerned, the antimicrobial effects of miswaks have been well-documented after discovery of its perfect chemical composition that helps with attaining good oral well-being. For instance, the silica found in miswaks adopt the role of an abrasive, which has the ability to remove tooth stains, resulting in cleaner teeth. Tannins found in miswaks take the role of astringents (a chemical compound which causes contraction of tissues to stop blood flow), which was found to help decrease noticeable gingivitis. Calcium saturated in the saliva, as a result of miswak use, was found to assist toward remineralisation of tooth enamel, supporting the production of stronger teeth at large. The resins found in it form a layer over the enamel to serve as protection against further microbial damage. Of course, many other medical properties have been discovered and confirm the comprehensive benefits miswaks have toward oral health, all of which inevitably help with having better breath! It is no wonder that Prophet Muhammad placed such great emphasis on the miswak to the degree where he would have ordered its use at every prayer time, should it not have become burdensome for the believers. Out of his magnificent mercy, our Prophet spared his people from perceived hardship. Nonetheless, that level of importance he ascribed to it through the above hadith clearly shows that a miswak is unquestionably beyond a piece of twig broken off a tree. Its benefits are endless! Whilst the miswak is associated with good mouth hygiene, as a part of cleanliness that is strongly encouraged in Islam, the miswak is also associated with good and pleasant odour, , another value that is promoted in this religion. The former notion in regard to hygiene is implied in the hadith, whilst also educating Muslims about its spiritual benefit. Use of the miswak is a noble act in the sight of Allah as well as an easy means to gain His pleasure and reward! This shows that the miswak is fitting to use whenever the smell of the mouth changes as a result from abstaining from food and water for a long period of time, or even as a result of eating food which possesses strong odour. In short, the use of miswak is emphasised before prayer and after waking up. 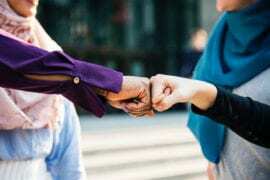 Its connection with oral cleanliness and pleasant odour has been implicitly and explicitly documented in Islamic literature and much later in scientific research. Furthermore, the spiritual benefit in the form of attaining Allah’s pleasure and reviving the Prophet’s sunnah should be taken well into account. It is easy in its method, affordable in its price, beneficial in its process, reliable in its use, and rewarding in practice. Using a knife, trim around 0.5 inches off the top of the miswak. You will be able to feel how deep to cut into the miswak when you are doing it. Slightly nibble on the miswak until it forms bristles. If the miswak is dry and lacking moisture, leave it in rosewater or fresh water for around 8 hours. Use the miswak in an up and down motion on your teeth. Trim the miswak every 3 to 5 days and follow from step 1 (excluding step 3). Is the miswak better than a toothbrush? One of the main reasons I love using the miswak is because of its convenience. Since no toothpaste or water is required, I use it immediately after I have had food or sipped on some coffee in order to protect my teeth from stains and the dreaded ‘something-stuck-in-my-teeth’ smile. Due to the recent trend in avoiding chemical products and moving to natural and more organic products, the miswak is the perfect option for people wanting to avoid all the artificial substances found in toothpastes and mouthwashes. Let’s revive this highly recommended sunnah and 100% natural method of maintaining oral health and hygiene: let’s decide to start using the miswak at least once a day, from today In sha Allah! Do you use the miswak regularly? Have you seen any benefits? Let us know in the comments below. Salina Ahmed is the content writer at MiswakClub.com. 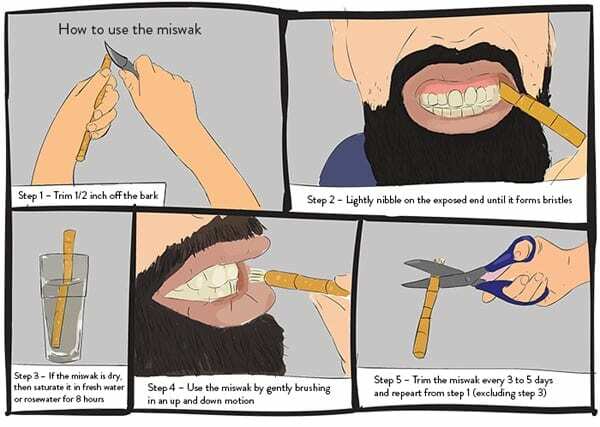 At Miswak Club, their goal is to provide the freshest and most premium miswaks out in the market.